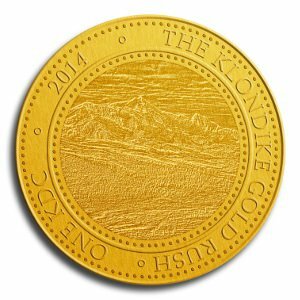 Klondike Coin - Join The Gold Rush!! Rumours are circulating of a valuable new resource in the Klondike region of Canada, people are heading there right now to strike it rich and get their hands on some! Rumours are it is some fabled crypto, thousands of prospectors are on their way hoping to change their lives. 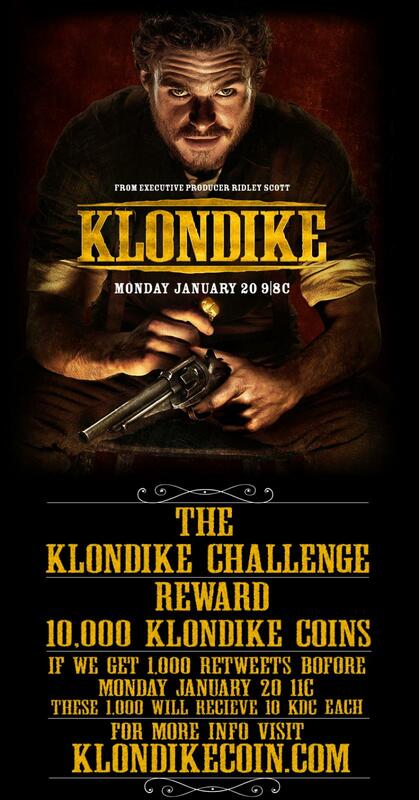 Klondike coin is inspired by the great Klondike Gold Rush that started over 100 years ago and ran for around 3 years. This coin will be mineable for around 3 years also, block rewards halving roughly every 3 months. The coin is relatively rare with just a little under 20 million in total. There was no pre announcement or premine as that wouldn’t have been a gold rush! 17/01/2014 An additional 5 nodes to ensure speed of network stays stable. Facebook Wallet & Tipper - Currently in Development and will be launched by February. This app will give you the ability to Send and Receive coins with facebook friends. 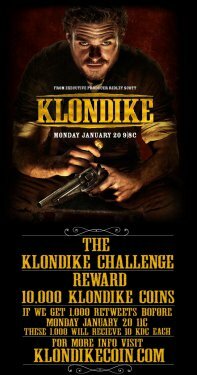 Invite Facebook friends to join the Klondike Coin App with information on where to trade / mine etc. There will be more features added to this as the months go on, but any features you would like to see added please add a post to this thread. Twitter Tipper - Currently in Development and like the Facebook app will be released by the end of January. The twitter tipper will give you the ability to send and receive KDC via tweets on twitter. 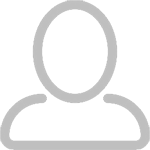 Klonpay - This will give merchants and users the ability to accept and use KDC on their online services. Think Bitpay / Paypal thats what were aiming for. Development on this will not start until the 2nd week of February. Please do leave feedback on anything you want to see! If you think phase 1 looks good, wait until you see phase 2. To spread the hashing power please don't choose the pool with the highest hash/s, a mid-low range hashing pool will pay out just as well. PLEASE DISTRIBUTE HASH POWER EVENLY TO AVOID TOO MUCH ON ONE NODE! Очередной.... после слов Please vote for us on cryptsy if you'd like to see the coin added to their exchange! Не могу зайти в пул http://kdc.coinarmy.com под своей учеткой, ни с помощью логина, ни с помощью имейла. Пробую сброс пароля, на меил ни чего не приходит, хотя пишет проверить почтовый аккаунт. Кто знает что делать, подскажите пожалуйста. Мне понравилось что команда активно интегрирует монету в сервисы. Прицел -дальний.